Yet the atmosphere of the Pavilion was engendered by the homeliness and intimacy of the years of sing-song activity at the associated tavern, the Black Horse. The scene is dominated by the procession of individual artists who have given immortality to the house. Of these the first great name, and for the fortunes of the house the most significant one, is that of Arthur Lloyd, rather strangely described because of his long life, by more than one commentator, as the last of the lions comiques. Right - The London Pavilion Now - Click for details of the Theatre. Actually, he was on the scene about the same time as Leybourne and Vance. Like the latter, he was trained as a legitimate actor. 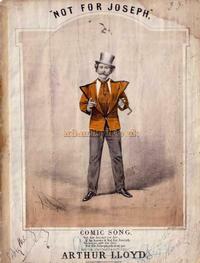 His father was a Scotch comedian of some local importance, and Arthur Lloyd's first professional experience was gained in the stock company in Edinburgh of which his father was a member. His success in songs performed between the dramatic pieces and a marked facility for writing tunes and lyrics suggested a transfer to concert-room work, and he accordingly made a beginning by appearing at the "Whitebait," a musical tavern in Glasgow. 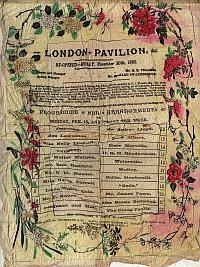 Left - A Silk Programme for Arthur Lloyd at the newly built London Pavilion in 1886 - Click to enlarge. 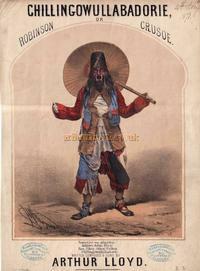 His arrival in London in 1862 or 1863 -'According to Macdonald Rendle, Lloyd was for a time apprenticed to a hatter in the Strand- where he secured an engagement at the Islington Philharmonic Hall, was quickly followed by his first great song success, and the consequent appearance at the London Pavilion (quite recently reconstituted under this title by two Jewish restaurateurs, Loibl and Sonnen-hammer) was the turning-point both in his own career and that of the new music hall. Under the influence of his personal triumph the house rapidly achieved a reputation, and its status was further raised by the adoption of a policy, instigated by Lloyd, under which the refreshment ticket method of admission was abandoned for a system of priced seats. The song which was in the main responsible for occurrences was called "Not for Joseph", it was written and -composed by Lloyd himself and, on publication, achieved an unprecedented sale. It was based on a study of an individual character, that of a 'bus driver named Baxter (the full name is given in the first line of the song), a man who was in the habit of referring genially to himself in the third person. The idea was one in complete harmony with the music hall of the time, based as it was on a piece of familiar observation. The raciness of the subject and the richness of Lloyd's power of character impersonation render its success understandable. Right - Arthur Lloyd's 'Not For Joseph' Click for details. He excelled in this quality of in-timacy allied with close observation. To choose an instance at random, the opening couplet of a forgotten song "Just by the Angel at Islington, Close by the clock that always is wrong," gives an indication of the personal style which resulted from his alertness to detail. - I cannot resist another couplet. A song, written round the phrase "just to Show there's no Ill Feeling," gives rise to: "Yesterday she gave me twins, just to show there's no ill feeling." Left - Arthur Lloyd's 'But of course it's no business of mine' - Click for details. At the same time, the shrewdness which enabled him to coin a hundred quotable phrases was not accompanied by the warmth of personality which is the pervading quality of a great artist. A number of his early songs were elaborate character studies, often of musicians and instrumentalists. He developed, also, a lyrical vein, as in the celebrated Pretty Lips Sweeter than Cherry or Plum. Then there were cockney studies, such as Immensikoff, and nonsense songs, of a type popular in his day, such as Chillingo-Wullabadorie. Right - Arthur Lloyd's 'Chillingowullabadorie' Click for details. Lloyd's face, which launched a thousand song-covers, was expressive-heavy, yet lit by a smile with a charming dimple in the cheeks. Concannon's portrait of him singing his German Band song is full of suggestion of the character of the man. Little of Lloyd's private life has become the subject of comment. Off the stage he was apparently not an entertaining person. One hardly looks for a private life from a man who appeared to divide his entire time between writing and singing such an overwhelming, number of songs. He was essentially Scotch, a family man who brought up a large number of children. Left - A Bill for Arthur Lloyd, and his wife Katty King and her brother Harry, at McDonald's Music Hall in 1867 - Click for details on this Theatre. His work was not limited to the music halls. As in the case of other leading comedians, he gave a recital entertainment, and toured with it. This bore the innocuous name of "Two Hours of Genuine Fun." 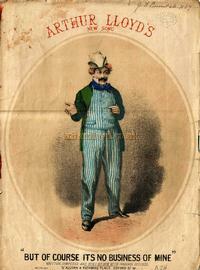 Like his successor, Macdermott, Lloyd was more-over a playwright, a four-act drama by him called Ballyvogan was performed at Newcastle-on-Tyne in 1887. Lloyd's successor at the Pavilion (though Lloyd survived him) was the "Great " Macdermott. This extract from 'The Early Doors' by Harold Scott(1946) was kindly supplied by Frederick Denny.